Aristotle [384–322 BC] was an ancient Greek philosopher and scientist. Holding a colossal legacy as one of the greatest philosophers of all time. Aristotle’s works shaped centuries of philosophic-thought from Late Antiquity through the Renaissance, and even today continue to be studied with keen interest from intellectuals far and wide. A student of Plato’s Academy, a teacher of Alexander the Great and credited for being the earliest man to study formal logic. Aristotle was known to be a prodigious researcher and writer who found himself fascinated by a wide range of disciplines; From biology, ethics, governance, logic, metaphysics, rhetoric and aesthetics. Aristotle’s contribution towards almost all subjects on earth and his influence upon them makes him one of the most famous personalities of all time. Please take a moment to appreciate the situation here. You’re reading this article, soon to embark on a journey into the thoughts of somebody who passed away over 2000 years ago. They had some ideas on the best way to live life, leaving their wisdom behind for us to ponder and reflect over. Try to think how these concepts relate to your own life – The upcoming ideas have stood the test of time for a reason. Aristotle assumed happiness was self-evidently the key goal of life. Why? Because happiness was the fundamental attribute that all humans apparently sought, with no further agenda desired beyond the achievement in itself. The question for Aristotle then—What would provide the best life for humans to achieve happiness? Aristotle understood the individual nature of humans. Each of us will go through unique individual experiences and construct individual perspectives of our external world. And it is within these individual perspectives, that we all form our notions of what is desirable to each and every one of us. This is why we witness certain people pursuing a life of competition while others choose a life of the arts or learning. Regardless of our individual desires, Aristotle noted that all humans share common desires regardless of their individual perspectives: Shelter, warmth, sleeping, eating, water etc. Through all these individual perspectives, people will find themselves desiring things that they don’t actually need to stay alive. Think of those who obsess over material goods. We’re constantly seeking things that we believe will enrich our lives for the better while often failing to grasp their inadequacies until it’s too late. Aristotle concluded that if we see something as desirable we generally perceive it as good. But that’s hardly the case now, is it? We’re regularly drawn to desires that are actually harmful to us. (Unhealthy food and alcohol come to mind for me.) Aristotle marks the aforementioned points as a distinction between things that we think are desirable to us, and things that we know are desirable as a constant—My survival depends on this. Wants and needs… Both present in the family of desire but entirely different in their meaning. It is the wants that have derived from our individual experiences in life, formed entirely from each of our own unique journeys. As a result, Aristotle claimed that it is the natural desires, that are the only things that are truly good for us—For our natural desires are things we all need whether we’re aware of it or not. Aristotle concluded that genuine happiness was something that all humans desired. Through our own unique journeys, we may attempt to seek these natural desires that provide us with true value and not just temporary amusement. We all typically form our own unique approach to seeking the consistent needs of food, shelter and water. But it goes without saying, some plans are better at doing this than others. Aristotle suggested that good and successful people all possessed distinct virtues that merely needed to be observed, so we can nurture these successful virtues in ourselves through habit and honour them in others. Aristotle determined that on either side of these virtues, stood vices that we should aim to avoid. 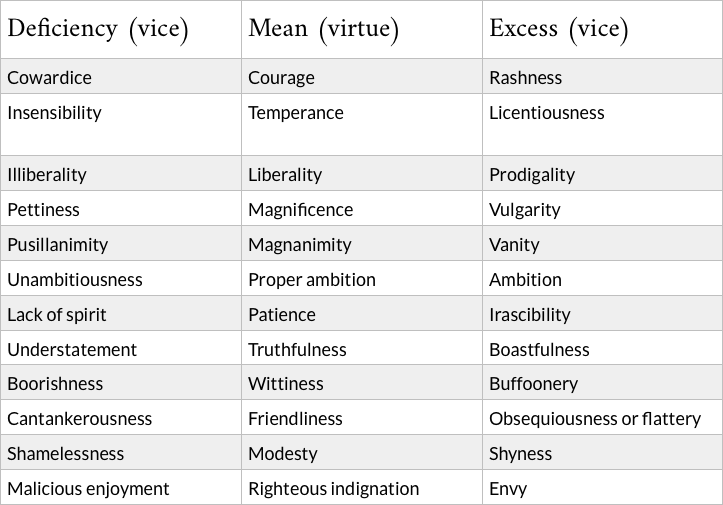 Aristotle argued that these deficiencies or excess positions are what destroys true virtue. And it was the Golden mean, which involves finding the balance between two vices that we should all seek. Imagine if you were out for a walk and you witnessed a group of thieves attempting to prey upon their elderly victim in open view. Those of you reading who lack courage would do nothing, those of you who are reckless would charge into the situation without a second thought resulting in a high-likelihood of negligence and defeat. But the man who holds the golden mean (courage) will act in the most virtuous way available to the situation. We most certainly can’t expect to align our personalities to the sweet spots of the golden mean with the drop of a hat. Aristotle himself understood this—He felt that habit and practice were the fundamental keys to building these virtues into one’s own life. Aristotle also believed that those who lacked virtue in life weren’t evil but simply needed better guidance from good teachers with encouragement and wisdom. “If there is some end of the things we do, which we desire for its own sake, clearly this must be the good. Will not knowledge of it, then, have a great influence on life? Shall we not, like archers who have a mark to aim at, be more likely to hit upon what we should? If so, we must try, in outline at least, to determine what it is.